ACRLog welcomes a guest post from Jennifer Joe, Owensboro Campus Librarian at Western Kentucky University. I will be leaving my students at the end of this semester. That’s the first time I’ve written that out (though by the time this is published, everyone will know.) I will be moving on to a new position, at a new university, in a new state. It will be a good move for me, personally and professionally, but it was not my choice. I would have happily stayed at my current position, but budget cuts forced the elimination of not only my position, but many others at the university. I was lucky. I had a year to look for a new position, and I didn’t need the whole year. Others were not so lucky. Still others have left my campus (a small, regional campus which is part of the larger university system) of their own accord. Some of the best people we have ever had are gone. Going forward, I will need to have that same flexibility. It isn’t a new or unique situation. I know for a fact I’m not the only one doing this – there is at the very least another librarian at a campus about 90 miles from mine doing the exact same thing for the exact same university and there are librarians across the country doing the same thing for other reasons: a colleague’s extended illness, a retirement or sudden death, staff who have quit unexpectedly or couldn’t be replaced on schedule. I’ve been in a few of those situations, too. The question then becomes: how do I do this from a mental and emotional standpoint? For that, I rely on the student-centered approach I’ve always taken to librarianship. My students may not always feel like they need me, but I know their lives will be better when they have the critical thinking and research skills that make up information literacy, and their lives will also be better when they know how to find (and land!) appropriate jobs that reflect their education and when their professors can use technology to teach their classes. What does that mean for my workload? That means continuing to organize presentations, displays, contests, and anything else that will continue engaging my students. There are some I do every year, and I am grateful to my past self for keeping good records of those events so that I can replicate them even as I am making arrangements to sign contracts, pack my house, and eventually move away. It also means trying to keep my tenuous hold on the relationships I have built with faculty who allow me to come into their classroom and use some of their precious time to teach their students about information literacy, while being unable to tell them with certainty what will happen to the library when I am gone. I hope my students will remember me when I move on to my new position, because I will remember them. They are what has motivated me these last few months, knowing that my job was coming to an end. I also hope that in the midst of budget cuts, staff turnover, never ending assessment, repeated requests for justification, and all the other things that can make being a librarian unpleasant, my fellow librarians will also look to their students for motivation and inspiration. Have you faced morale problems in your library recently? Were they things in your control or out of it? How did you cope with them? Share your experiences in the comments – it’s always nice to know you’re not alone! Were You Taught to Teach? Until now, I haven’t had to face this question head-on. I’ve always felt like I learned how to teach by sneaking in the back door: on-the-job trial and error. 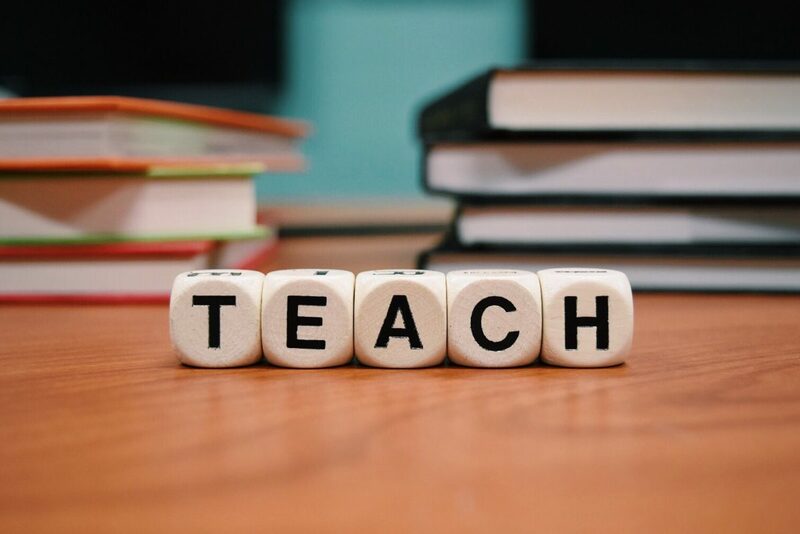 Thinking of the teachers I know, who went through a curriculum of education theory and supervised student teaching, I felt inadequately prepared. Realizing I couldn’t articulate my teaching philosophy only reinforced my sense that I wasn’t a “real” teacher. That question sparked a summer of contemplation, reading, and informal interviews with the teachers in my life. What is my teaching philosophy? Can I put it into words, and how does it actually relate to my day-to-day practice? At schools where librarians do not have faculty status, the conversation is further complicated. But for me, embracing a “teacher identity” has changed how I see my presence in the classroom. I stop thinking of myself as a guest speaker, here for the one-shot and never to be heard from again. If I am a teacher, I am building relationships with students. This changes my expectations, and affects the very language I use. For example I find myself closing an instruction session with “It’s nice to meet you,” instead of “Thank you for having me” or similar. If you develop a strong teacher identity, new avenues of inspiration online and support on campus become available to you. In search of language to form my teaching philosophy, I began looking beyond library literature and traditional information literacy learning activities, reading more about pedagogy than had ever been assigned in my LIS program. I found a multitude of practical, approachable resources for teachers developing their teaching philosophy. This resource from the University of Minnesota had particularly helpful prompts to get me started. If you’re not a teaching librarian, or you want to take baby steps toward writing your teaching philosophy, I recommend exploring the elevator speech. I’d first learned of elevator speeches from ALA’s advocacy resources, during a time when I was advocating for my department to be fully staffed. An elevator speech is a more all-purpose message to the public or to your larger institution, and can be on any topic. Writing brief statements to sum up my vision for the Reference department helped me learn to put my daily practice into more abstract, inspiring terms. This has been a helpful exercise as I develop a teaching philosophy. Even if you only break it out to answer an acquaintance’s smug “Aren’t libraries obsolete?” with something thoughtful and pithy, an elevator speech is a nice thing to have in your pocket. Taking the time to identify the values I want to support – curiosity, persistence, failure as a part of learning – has influenced the way I design class activities and how I interact with students. Having my teaching philosophy fresh in my mind as I walk into the classroom has helped me be more a more thoughtful teacher. If you’re not like me, and pedagogical training was built into your library degree, how have you experienced the transition from theory to practice on the job? In your opinion, what are the essential readings in pedagogy or teaching philosophy? I’d love to hear your thoughts! Featured image by Wokandapix via Pixabay. Author Emily Hampton HaynesPosted on October 26, 2018 October 25, 2018 Categories library careers, LIS Education, Teaching, Uncategorized3 Comments on Were You Taught to Teach? A few days ago, In the Library with the Lead Pipe published an article by Fobazi Ettarh titled Vocational Awe and Librarianship: The Lies We Tell Ourselves. Ettarh uses the term “vocational awe” to “refer to the set of ideas, values, and assumptions librarians have about themselves and the profession that result in beliefs that libraries as institutions are inherently good and sacred, and therefore beyond critique.” Her article masterfully traces the root of this vocational awe, from the intertwining history of faith and librarianship to our current state, where librarians are expected to literally save lives. Ettarh argues that vocational awe leads to some of the structural problems in our profession, like lack of diversity, undercompensation, and burnout. I will admit that I initially felt some defensiveness when I started reading this article. One of the reasons I became a librarian is because I wanted to care about and be engaged with the mission of my work, and I do deeply believe in the values that libraries try to uphold. When I got past that initial reaction, I realized how Ettarh’s research allows us to talk about our profession more honestly. As the author clearly states, the article doesn’t ask librarians not to take pride in their work. Nor is it an indictment of our core values (although it does, rightly, point out they are inequitably distributed across society). Rather, it encourages us to challenge the idea that our profession is beyond critique, and therefore opens up space for us to better it. Although this is not its primary intent, I wonder whether this research direction will help us resolve some of our own tortured professional identity issues. I am among those who became a librarian partly out of passion and partly out of convenience. I didn’t feel called to the profession. Instead, I made a conscious decision based on my interests and the sort of life I wanted for myself. I knew I wanted to be in a job where I would be helping people, with the opportunity for intellectual growth, and that I wanted to have a stable job with a balance between work and my other personal interests. Librarianship seemed like a very natural fit. But the vocational awe in librarianship means that you’re surrounded by the idea that being a good librarian means being driven solely by passion. Heidi Johnson previously wrote about the isolating feeling of not being a “born librarian” here at ACRLog, and I remember this post resonating deeply with me when I first started to become self-conscious that my professional identity was built less on my sacred calling to it than some of my peers. I think that unpacking the vocational awe that makes us feel this way might help to dispel some of the professional identity issues that so many librarians, and particularly new ones, seem to have. As I was thinking about this article, I also realized that my own version of vocational awe usually manifests when I’m talking to non-librarians. Telling people I’m a librarian produces surprisingly revealing responses. Some people respond a well-meaning, but misinformed, “how fun! I wish I could read books all day, while others respond with some variation of “but aren’t libraries dying?” I suspect that this is partially a result of the slew of articles that are published every year on the decline of libraries and the death of librarianship. After responses like this, I feel compelled to defend librarianship in the strongest terms. I talk about information literacy, intellectual freedom, public spaces, privacy, access to information, democracy, you name it. I turn into a library evangelist. None of my own hesitations, challenges, or frustrations find their way into these conversations. Several people have already written about the exhaustion of constantly defending and explaining our profession. But this article made me wonder if there is some connection between how often we find ourselves needing to defend what we do — to friends, to faculty, to funding agencies, to the public — and tendency to resist the idea that there is a lot of internal work we need to do to truly uphold the values we claim. Ettarh’s article made me think about how to balance these two ideas: believing in and advocating for my profession, while working to make it better for the people in it. What does that look like? I’m not entirely sure yet. But I think it entails being more honest. It means advocating for our value, but not pretending that we can do everything. And it means contributing to a culture that doesn’t valorize martyrdom. For me, that means saying no if I don’t have the bandwidth for a project. It means using my all my vacation time, and stopping using busyness as a measure of worth. There is much more to the article than I can unpack here, and I hope that everyone will go read it. I’m looking forward to hearing other people’s thoughts on how vocational awe impacts our profession, and how we might work to stop using it, as Ettarh puts it, as the only way to be a librarian. Please welcome our new First Year Academic Librarian Experience blogger Nisha Mody, Health & Life Sciences Librarian at the Louise M. Darling Biomedical Library at the University of California, Los Angeles. In the summer of 2016, I decided to start applying for librarian jobs. I wouldn’t graduate until May 2017 at the earliest, but a Health & Life Sciences Librarian position at UCLA immediately sparked my interest. Before getting my MLIS, I was a speech-language pathologist. And I love the sun. These two experiences convinced me that I was qualified for this position. I figured this would get me to start updating my resume and website (which now needs more updating). And it worked, I got the job! I was shocked and overjoyed. Since I was applying to jobs on an earlier timeline, I also ended up starting my position before I finished my MLIS. Thankfully, the University of Illinois at Urbana-Champaign has an online learning option to complete an MLIS. So I moved out to La La Land in March 2017 to start my first real librarian job. I have been in my position for a little over 6 months now, and while it took me awhile to understand the myriad of UCLA acronyms, I am finally starting to feel that I have a decent grasp of how things work. However, this grasp has been very (or not very) informed by my experience in my MLIS classes and while working at the Communications Library. I was also able to chronicle several of my experiences and reflections while writing for Hack Library School. Similar to Abby, I took the advice to get as much library experience as possible. I tried my best given that this is my third career, I am in my mid-30s, and I honestly just wanted to get this show on the road. While working at the Communications Library, I gained knowledge about the importance of positive patron interactions (and how to communicate in not-so-positive interactions), outreach, library organization, the integrated library system, interlibrary loan, and the myriad of possibilities to be more critical in all of these areas (and more). In library classes, I learned the value of intellectual freedom and how this related to control. I learned how various medium of books (print, electronic, and everything in between) are perceived and used. While I don’t ever see myself working in technical services, I gained knowledge about cataloging and metadata which have helped me understand how resources are categorized. My involvement in University of Illinois’ local Progressive Librarian’s Guild chapter allowed me to advocate for issues seemingly outside my immediate library space. I was also able to integrate experiences from library school to my work in a library through an independent study by starting a Human Library chapter. All of these lessons (and probably more) were essential to how I view the library today. They have given me the framework for my work today and in the future, especially to never remain neutral as a librarian. One of the things I loved about my program was that there was a lot of freedom in the classes you could take. However, the downside of this is that I chose to take classes that looked oh so dreamy. As a result, some of the practical classes fell by the wayside. I wish I took classes around collection development and the administration and management of libraries. I never felt the urge to be a collection development librarian, but I do have to start making these decisions within my current role. I know I can learn this on the job, however, having a better foundation would have been helpful. I am only now really seeing Ranganathan’s fifth law, “The library is a growing organism” in action. But, in my opinion, it is critical to really understand how different functions within a library relate to each other to see this organism in action. After being in less fulfilling careers, I was resolved to take the classes I was passionate about. And while I am happy I was able to do this, I forgot that I am also passionate about the library itself. This required me to have a grounded understanding in all of the different areas of librarianship whether I was to focus upon them or not. What have I been able to transfer? While I am thrilled to not directly be working in corporate culture (because, let’s be real, it is always integrated in our work), I did learn valuable skills regarding project management organizational structure, processes, and workflows, that I can infuse into my work today. I also dealt with various stakeholders in these positions; I see how these interpersonal skills have been beneficial when I interact with vendors now. These experiences have also given me critical thinking skills to analyze and navigate through a stakeholder’s motives and desires. My work as a speech-language pathologist has first and foremost amplified my empathy. Invisible disabilities are real, and I have learned to never assume anything about a colleague and/or patron. While working in the schools, I learned about a lot of economic, family, and social obstacles that many of my students faced. Everyone has a story, and this has been important for me to keep in mind as a librarian. Additionally, being a speech-language pathologist requires one to create tangible goals for patients/students/clients to measure progress. This has easily translated into learning outcomes for library instruction. I realized that I have always been a teacher of sorts, and while the setting is different, the skills are transferable. I am truly looking forward to contributing to this blog, and I hope that my skills and knowledge are ever-increasing – building upon the past and supporting a growing organism.